As part of its ongoing effort to preserve the legacy of Sviatoslav Richter, Parnassus is pleased to announce the return of a truly legendary recording: Richter in Leipzig. 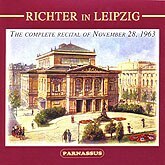 This recording preserves the complete concert of November 28, 1963 at the Leipzig Gewandhaus. It is the only published recording of one of Richter's favorite programs: the last three Sonatas of Beethoven. While Richter played this music throughout most of his career and programmed these three Sonatas together as late as 1991, this recording is the only one ever issued with all three as performed at a single concert. The original publication of this recording by another company was quickly suppressed by legal action, making it among the scarcest and most expensive of all Richter recordings. These legal issues have been resolved in U.S. Federal Court in favor of Parnassus, permitting the republication of this CD. The master tape of this recording was marred by noticeable flutter thoughout most of the Sonata Op. 109. A process developed by Plangent Processes of Nantucket, Mass., has minimized the flutter to the point where the recording is consistently listenable. Audio remastering by Eldad Benary of The Sound Company, in Saugerties, New York, has improved the tonal qualities of the recording, which were quite good to begin with. As a result of these improvements, the mono recording now gives a faithful impression of Richter's playing and preserves his sound surprisingly well. Richter's performances of these three Beethoven Sonatas are up to his highest standard, one of the reasons why this recording has been in such great demand. There are also four encores, superbly played music of Brahms and Chopin, to further enhance the interest of the disc.